From random checks on 50 samples of cosmetics for face-whitening, the Medical Science Department has found 12 of them to contain mercury, a substance which can be harmful to kidney, the nervous and respiratory systems and skin. Dr Sukhum Kanchanapimai, the department director-general, said the mercury content found in the 12 samples of cosmetics ranges between 0.035 – 3.959% of total weights. Mercury is a banned substance in cosmetics according to a Public Health Ministry announcement. The substance is harmful to kidney, the nervous and respiratory system and skin. After a long use, mercury can accumulate in the skin and can be absorbed into the blood system, leading to liver and kidney troubles, anemia, urinary tract infection, and damaging the colours of skin and nails. Dr Sukhum said buyers of cosmetics sold in the internet should be careful and they may have high mercury content. People should buy only reliable brands of cosmetics with clear manufacturers, to avoid becoming victims of false advertisements, he said. 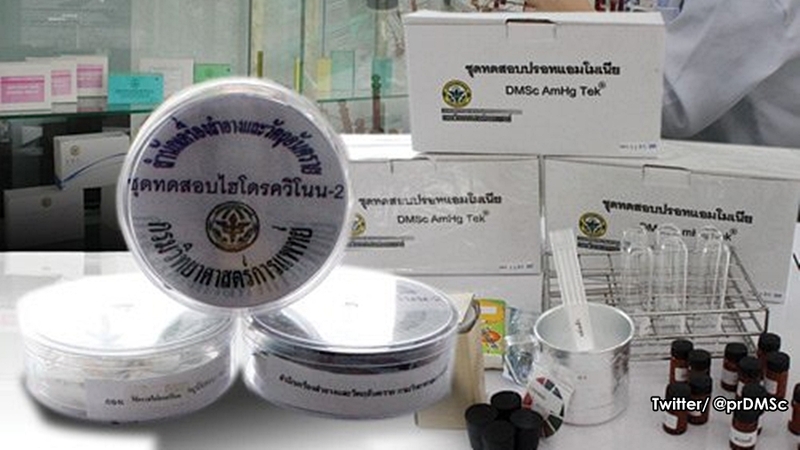 The Medical Science Department has introduced an application, Natang Tuanpai Sukhapap (Health Warning Window), to give information on cosmetics products. The department has also developed test kits for several other chemical substances in cosmetics.